What do the 2016 local elections tell us about what might happen in 2020? On Thursday May 5th elections for local and devolved governments took place across the UK. For the main British political parties, each part of the country told a slightly different story. In Scotland it was a bad night for Labour, who slipped to third place behind the Conservatives who had their best ever performance at a Scottish Parliament election. In Wales Labour defied expectations and lost only one seat while the Conservatives lost three. In England the main story of the local council elections seems to be that little has changed. In this blog I am going to focus on this final set of these elections – those for local councils – and what the results can tell us about the current state of the parties and their prospects for success at the next general election. What is more useful is the number of votes cast for each party across all local council elections, which act a bit like a massive opinion poll. Local elections results have two potential advantages over conventional polling because of (1) their sheer scale, and (2) the information they provide is based on actual voting behaviour rather than reported intentions. 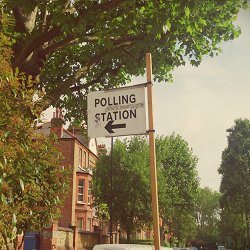 Given the problems with opinion polls in 2015 and the uncertainty over whether the underlying problems with polling have been adequately addressed, local elections provide an invaluable benchmark of how the parties are doing. Because Scotland hold council elections on a different timetable and local elections in England and Wales are held with a rotating combination of different councils facing election each year we cannot simply take the number of votes at face value. Fortunately these problems are overcome thanks to two estimates of the GB national vote performance of the main parties at local elections as if they were held nationally and the main parties fielded candidates in every ward. The first, the National Equivalent of the Vote (NEV) is produced by Colin Rallings and Michael Thrasher. The second, the Projected National Share (PNS), is calculated for the BBC by a team lead by John Curtice and Steve Fisher. The BBC’s Projected National Share of the vote for the 2016 local elections is Conservative 30%, Labour 31%, Liberal Democrat 15%, and UKIP 12%. These results can tell us a great deal about future election performance – not because the results do not vary between local and general elections but because they tend to vary systematically. Incumbent governments tend to suffer from ‘midterm blues’ at local elections – on average incumbent governments do 5-6 points better at the next general election than local elections whilst the main opposition party does 2-3 points worse. Before the last election I developed a method for forecasting general election performance based on local election vote shares that takes these differences into account. The forecast uses local election vote share estimates and controls for party and incumbency differences in the relationship between local and general votes shares. It does not model the time until the next election because historically local elections four years before a general election are no better or worse predictors of future elections than those only one year before. Although it was necessarily based on data that was at least years old by the time of the 2015 election the method performed remarkably well in 2015 – of the 12 academic forecasts submitted to a special symposium on forecasting the 2015 election my local elections method was the closest to the actual Conservative lead in the election and correctly forecasted that the Conservatives would win the most votes. So what does my forecast tell us about what might happen in 2020? Using the PNS results my model predicts that the Conservatives will get 37% of the vote, Labour 30%, Liberal Democrat 11%, and UKIP 11%. Unsurprisingly given that the next general election is likely to be four years away there is a great deal of uncertainty in exact vote shares forecast, as illustrated in the figure below. Despite the uncertainty over the exact vote shares the forecast is very confident – with a 92% probability – that the Conservatives will be the largest party at the next general election. What should we make of these predictions? The obvious thing is that it is bad news for Labour, who look very unlikely to be the largest party at the next election. They also suggest that the impact of Jeremy Corbyn on Labour’s electoral fortunes has been fairly small in either direction – he might not be making any inroads into the Conservative’s lead, but it does not look like he is losing many votes either. Of course between now and the next general election lies the EU referendum. As we saw in 2015, big political events like referendums can disrupt the usual pattern of politics. If the fallout from the EU referendum goes badly for the Conservatives this forecast is likely to be inaccurate. However if politics continues on much the same course as now, then the Conservatives look almost certain of emerging as the largest party in 2020. The NEV had not been released at the time of writing. An open access version of the article is available here.